Investors' despair about financial companies and the recession has brought the Dow Jones industrial average to another unwanted milestone: its first drop below 7,000 in more than 11 years. The market's slide Monday, which took the Dow down 300 points, was nowhere near the largest it has seen since last fall, but the tumble below 7,000 was nonetheless painful. The credit crisis and recession have slashed more than half the average's value since it hit a record high over 14,000 in October 2007. And now many investors fear the market could take a long time to regain the lost 7,000. "As bad as things are, they can still get worse, and get a lot worse," said Bill Strazzullo, chief market strategist for Bell Curve Trading. Strazzullo said he believes there's a significant chance the S&P 500 and the Dow will fall back to their 1995 levels of 500 and 5,000, respectively. The "game-changer," he said, will be the housing market and whether it can stabilize. A recovery will also require signs of health among financial companies, but so far in 2009, it is clear that banks and insurance companies' losses are multiplying despite hundreds of billions of dollars in government help. The market fell Monday after insurer American International Group Inc. posted a staggering $61.7 billion in quarterly losses and as the government agreed to inject more money into the company. AIG will get another $30 billion in loans, on top of the $150 billion the government has already invested. And it's not just U.S. companies that have Wall Street frightened. HSBC PLC, Europe's largest bank by market value, said Monday it needs to raise $17.7 billion. The company reported a 70 percent drop in 2008 earnings and said it would cut 6,100 jobs. While the root of financial firms' problems lie with the bad bets they made on mortgages and mortgage-backed securities, now the recession is exacerbating their problems as it also forces millions of job cuts. "The economy definitely has deteriorated since November," said Sean Simko, head of fixed income management at SEI Investments. "It's just the fact that we haven't seen signs of improving or stabilizing, per se, which is adding to the morass of the market." CBS News correspondent Anthony Mason reports that among all the shocking new numbers, there is this one: Americans are socking away money at rates we haven't seen in more than a decade. In just six months, the personal savings rate has skyrocketed at an unprecedented rate - from less than 1 percent to 5 percent, the highest since 1995, Mason reports. And analysts say it could be headed for 8 percent - a level we haven't hit consistently since the 1980s. "Until consumers can rebuild the holes in their balance sheets that's been caused by the stock market decline and caused by the house price decline, they're probably going to want to save more to rebuild their balance sheets," Wachovia economist Jay Bryson told Mason. According to preliminary calculations, the Dow fell 299.64, or 4.24 percent, to 6,763.29. The Dow last closed below 7,000 on May 1, 1997 and hadn't finished at this level since April 25, 1997. The Dow's descent has been swift. It took only 14 sessions for the average to go from above 8,000 to below 7,000. So far this year, the Dow is down 22.9 percent. Broader stock indicators also slid. The Standard & Poor's 500 index fell 34.27, or 4.7 percent, to 700.82. 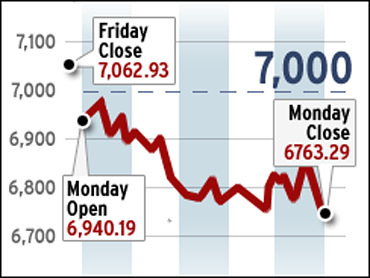 The index briefly traded below the 700 mark in the final minutes of the session. S&P 500 index hadn't traded below 700 since Oct. 29, 1996. It hasn't closed below that level since the previous day, Oct. 28. The Nasdaq composite index fell 54.99, or 4 percent, to 1,322.85. The Russell 2000 index of smaller companies fell 21.22, or 5.5 percent, to 367.80. The Dow Jones Wilshire 5000 index, which reflects nearly all stocks traded in America, is down 55 percent since its peak in October 2007. That's a paper loss of $10.9 trillion. About 16 stocks fell for every one that rose on the New York Stock Exchange, where volume came to a heavy 1.80 billion shares. Bond prices jumped as stocks fell. The yield on the benchmark 10-year Treasury note, which moves opposite its price, tumbled to 2.88 percent from 3.02 percent late Friday. The yield on the three-month T-bill, considered one of the safest investments, slipped to 0.24 percent from 0.25 percent Friday. Oil prices fell more than 10 percent to $40.15 a barrel Monday as investors worried that a weak economy will hurt demand. The economic data have been mostly grim, adding momentum to the market's slide. Even when the readings show some room for optimism many investors have been quick to write them off as aberrations. On Monday, the government said personal spending incomes rose more than expected in January but that construction spending fell twice as much as forecast. A trade group said manufacturing contracted in February for the 13th straight month, but at a slower pace than expected. More, and possibly unnerving, economic data are expected later in the week, including the government's report on unemployment and job losses during February. "I don't think we find a bottom in the market until we see some sort of increased level of optimism and confidence among consumers and investors," said Jim Baird, chief investment strategist at Plante Moran Financial Advisors. One measure of unease in the market has been rising after coming down from the fall. The Chicago Board Options Exchange Volatility Index, or the VIX, is just below 53. Ordinarily what's known as Wall Street's fear gauge might be in the 20s and 30s but it had near 90 in October. Dan Deming, a trader with Strutland Equities, said the VIX indicates investors expect more volatility. He said more investors are resigning themselves to the fact that stocks will continue to push lower. "The expectation is we're going to go lower," he said. Market historians would be quick to note, however, that market bottoms often come just as most investors are prepared to give up in disgust or fear. For investors, that will take several months of economic and corporate reports that point to signs of a turnaround in housing and job losses and signs that the economy is at least leveling off. Analysts are looking for indications that businesses and consumers are starting to boost spending after months of cutting back. But the economic readings, and the news coming out of financial companies, are still so alarming that investors feel no alternative but to sell. "I don't think we find a bottom in the market until we see some sort of increased level of optimism and confidence among consumers and investors," said Baird. And even when the market finally reaches a bottom, it faces a long, long recovery. "We do feel that things can improve but it is going to be years before we get back to levels we saw in the markets a year ago," said David Chalupnik, head of equities at First American Funds. Last week, the Dow and the S&P 500 index fell below their Nov. 20-21 lows, reached at the height of the credit crisis. Many traders had hoped would mark the market's low. The Nasdaq remains 2 percent above its Nov. 21 low. Even big name investors are cautious. Billionaire investor Warren Buffett wrote in his annual letter to investors Saturday he is sure "the economy will be in shambles throughout 2009 - and, for that matter, probably well beyond - but that conclusion does not tell us whether the stock market will rise or fall." Many market analysts look to Wall Street's performance in past bear periods to try to determine when stocks will hit bottom. In the last 60 years, the S&P 500 index bottomed about five months before a recession ended and nine months before corporate profits reached their low or unemployment hit its peak. The market could recover before the economy starts picking up steam but investors will need some sense that the worst is over - and that was hard to come by Monday.